The Simba hybrid mattress has been developed using extensive sleeper research through the US-based Sleep to Live institute. This has resulted in a mattress that’s designed to support every size, shape and sleeping style. Its 5 layers include latex, conical pocket springs, responsive memory foam and 7-zone support foam. 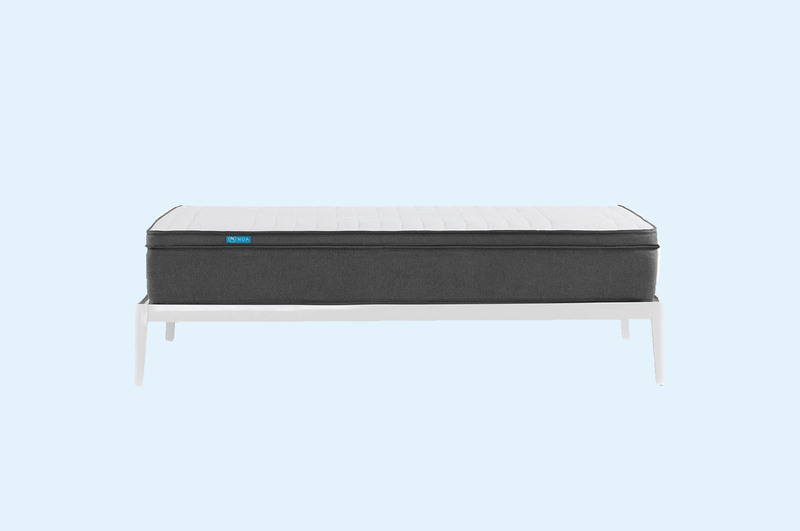 The Simba is a medium to firm responsive and supportive mattress, especially good at contouring to side and back sleepers. Priced on the higher end, its unique design promises a comfortable and cool night’s sleep for everyone. Our review aims to help you understand whether the Simba mattress is right for you. We’ve compiled independent reviews that cover customer insights on firmness, sleep quality, materials, customer service and more. By the end of it, you’ll have a better understanding of whether the Simba will provide you sweet dreams. We recommend the best way to find this out is to try it in the comfort of your own home. How does the Simba mattress feel to sleep on? The Simba is designed to suit every size, shape and sleeping style. A hybrid mattress combining pocket springs and memory foam, it’s responsive and comfortable as well as supportive. It rates as a 6/10 on the firmness scale, making it medium to firm with a moderate level of sinkage. The Visco memory foam moulds to your body, giving a supportive hugging sensation. The pocket springs provide all-over body support. The top latex layer is covered in Simbatex, a new material developed especially for the Simba. Natural soybean balms mean it’s cool to touch. The breathable sleep surface and grooved support base allows air to flow freely around the mattress, keeping sleepers cool. Customers rate how the Simba feels firm and holds you through the night, while still being soft and comfortable. The conical pocket springs, developed by Simba, pivot in their pockets, adapting to sleepers’ body shapes. They offer full body support and minimise partner disturbance. Because each spring adjusts individually, sleepers experience pressure point relief throughout the night. A memory foam layer provides additional comfort. This tailored support could be good for back pain sufferers. Try it out by taking advantage of the 100-night trial and free returns. The Simba was created using data. Research from more than 10 million sleepers, including 180 million body profile data points, shaped its design. This means the Simba is intended to suit all sleep styles. However, customers suggest that stomach sleepers may find the contouring of the mattress uncomfortable. As it hugs the waist, it can cause pressure on the unsupported lower back. Side sleepers enjoy the contour, hug and support of the Simba. The 7-zoned support foam base was designed with side and back sleepers in mind and provides pressure relief where it’s most needed. An area the Simba excels at is edge support. Traditionally, mattresses in a box struggle to maintain good edge support. However, there’s an extra layer of foam placed around the perimeter of the Simba’s springs. This means it maintains a great level of support around the edges. It’s perfect if you sleep close to edge or like to sit down while getting dressed or undressed. Simba’s patented conical pocket springs pivot in their pockets to adjust to different shapes and movements. They also reduce movement transfer between two people, meaning there is minimal partner disturbance. Most customers agree that they can’t feel their partner’s movements. What is the Simba mattress made from? The Simba has 5 different layers with a total depth of 25cm. It begins with a hypoallergenic sleep surface that regulates body temperature, helping to keep sleepers cool even on hot Aussie nights. The top layer is made of Simbatex synthetic latex infused with natural cooling soybean balms. This 4cm layer is breathable and doesn’t trap heat. Air flows freely around the mattress, making it cool to sleep on. Next comes 20mm of conical pocket springs, enclosed in 100% polyester. These 2,500 springs move horizontally and vertically, providing support for all body shapes and movements. The springs are sat on a 3.5cm layer of Visco memory foam. This provides the contouring and hugging sensation of the Simba. Finally, there’s a 15.5cm layer of high resilience / density foam for comfort and support. With 7 different zones and ridges, it creates a durable mattress that promotes air flow and temperature control. All foams used in the Simba have received the CertiPUR label. This means they meet the requirements of unwanted chemicals in foams – there are no heavy metals, flame retardants, mercury or lead used in their manufacture. Plus, all Simba mattresses are sourced and made in Europe with factories in the UK and Poland. The Simba’s cover is 100% polyester. It’s not removeable or washable and Simba recommends cleaning it with light fabric cleaning products or a soft, damp cloth. It’s standard mattress colours – white on top, grey sides – with a large teal Simba label. There’s a cushioned effect on the top and overall it looks sleek, simple and modern. The cover is thin to allow airflow, which is good if you sleep hot. Whatever size Simba you order, it’ll be delivered in a 107cm x 50cm x 50cm box. The queen weighs 39kg, making it heavy to move around. Note that it’ll be delivered to your front door only. Which means you’ll need to bring it inside your house and up any flights of stairs. 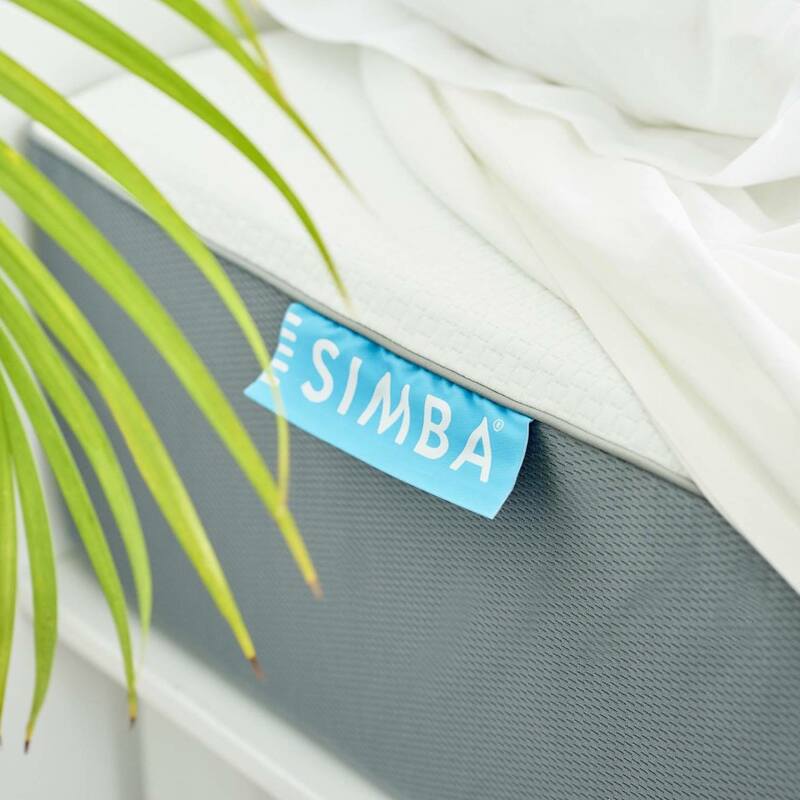 Once you’ve removed the Simba from its box, it’s easiest to roll the flattened mattress on your bed base, or wherever you’re placing it. There’s a cutting tool inside the box to allow you to cut the plastic and break the vacuum seal. Customers enjoy how it only takes 3-5 hours before it’s ok to sleep on (Simba does say it can take up to 24 hours to fully form). They also suggest 30 nights is a good length of time to adjust to the mattress. Some customers noticed a slight smell, caused by the Simba’s foam. This fades within a few days. The Simba doesn’t need to be turned but to lengthen its life, it’s recommended to turn it monthly. The Simba is 25cm thick which means it’ll fit all your normal sheets. It’s designed to sit on any firm and even surface. This includes slatted, flat, divan, box spring or adjustable bed bases and even the floor. With slatted bed frames, it’s recommended that the slats are no more than 3” apart. For older box springs with only a few support slats, use a length of plywood to support the mattress. How much does the Simba mattress cost? The Simba is averagely priced in single and double sizes, neither the most affordable or the most expensive option. Which is a little surprising because of its unique hybrid design that’s been developed by data and features both pocket springs and memory foam. But going up a size to queen will set you back almost $1,200, making it one of the most expensive online mattresses. The 100-day trial is a good way to see whether spending the extra money is worth it. Delivery is free nationwide and takes 1-7 days. Orders are processed the same day if you order before 2.30pm Monday to Friday. Delivery is only Monday to Friday, with no weekends or public holiday deliveries currently offered. Delivery is the biggest area of customer complaints. Multiple customers have complained about Simba’s lack of communication, including tracking numbers not being provided. Some deliveries have been scheduled for a certain weekday, requiring customers to take a day off work or work from home, only for the delivery not to turn up. Customers then say it takes a while for Simba to contact them to reconfirm another delivery date. Some customers have ordered a Simba, been provided a delivery date and then been informed that the mattress is out of stock. Customers wanting to return their mattress during the 100-night trial have also struggled, with phone calls and emails going unanswered. There are also complaints about the mattress developing a ridge down the middle and sagging on one side. The 10-year guarantee should cover this but again, some customers have struggled to access this. Who is the Simba mattress best for? 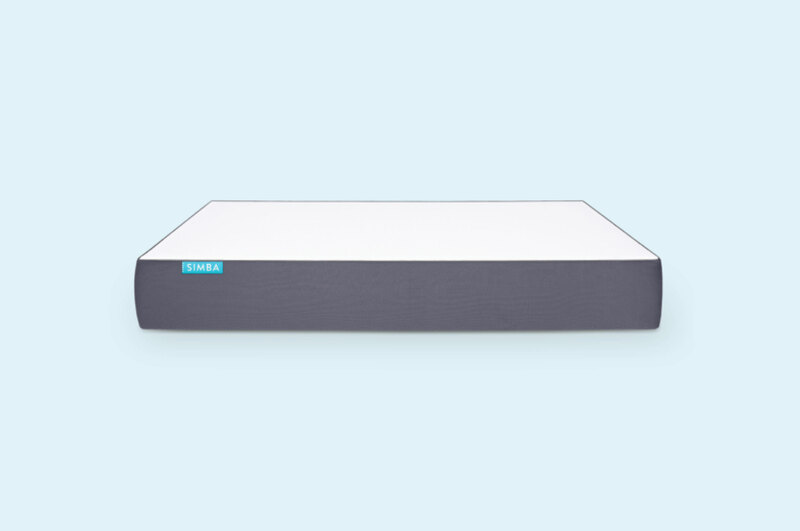 We believe back and side sleepers who are looking for a snug, supportive mattress will enjoy the Simba. With its focus on keeping sleepers cool thanks to the Simbatex technology and airflow promotion, it’s also a good option for people who sleep hot. Because of its responsive memory foam, sleepers who dislike the sensation of being held firmly throughout the night won’t be a fan. Love a soft, sinking feeling? The Simba isn’t your best choice. If you’re a firm believer in science and like a firm mattress, see whether the data-driven Simba works for you.